As I said earlier, our day started bright and early. We were up at 6:30, did some last minute organizing and then headed down to grab a quick bite and coffee before getting a taxi to the domestic airport. Karla, our guide for the past 10 days was up to meet us. She is looking into what can be done to refund at least 2 nights of the hotel. She’s been wonderful! We were sorry to leave her behind as we headed off in our taxi. She has a busy day as well as she flies back to her home in the middle of Argentina this afternoon and has to do a quick turnaround to meet 50 students for 3 days of mountaineering tomorrow!!! Did I mention that she has lots of energy??? Dan and I made it to the airport with plenty of time to spare. Our flight was on time, and we enjoyed a pretty uneventful trip to the falls airport. We were met at the airport by our local guide “Richardo”. He took us to get our boarding passes for tomorrow as he informed us that because of the rainy day, he would be doing the tour tomorrow am instead of this afternoon. Good thing for us! It gives us time to get to our hotel, have some lunch and get into our rooms for a little catch up on some sleep! 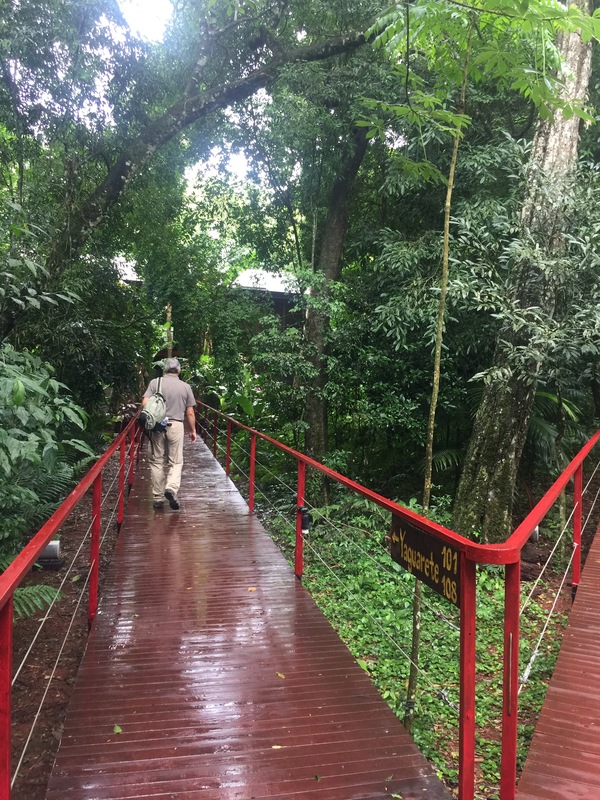 Our hotel is located in the jungle between the national park and the town. 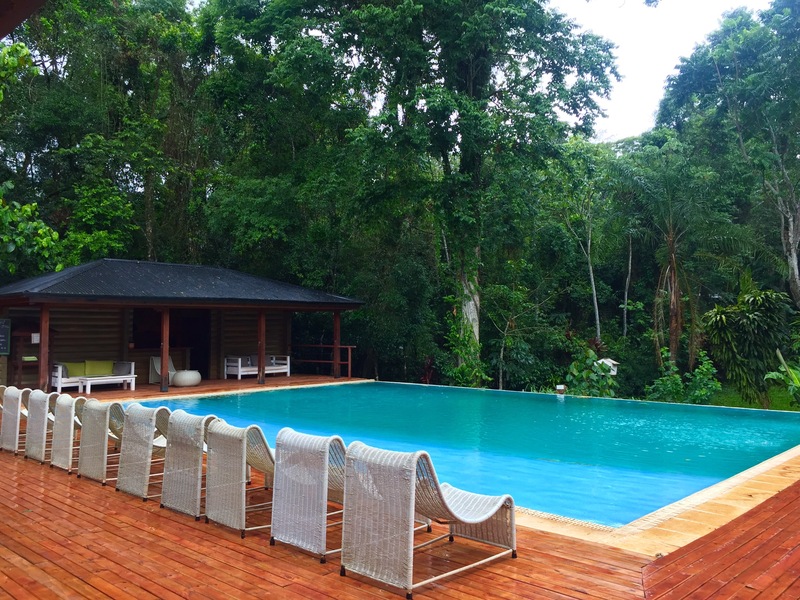 A beautiful setting, with a lovely pool for lounging…. we haven’t done much of that this entire trip! We sat by the pool under the awning and had some lunch while we waited for our room to be ready. What an interesting route to our room! 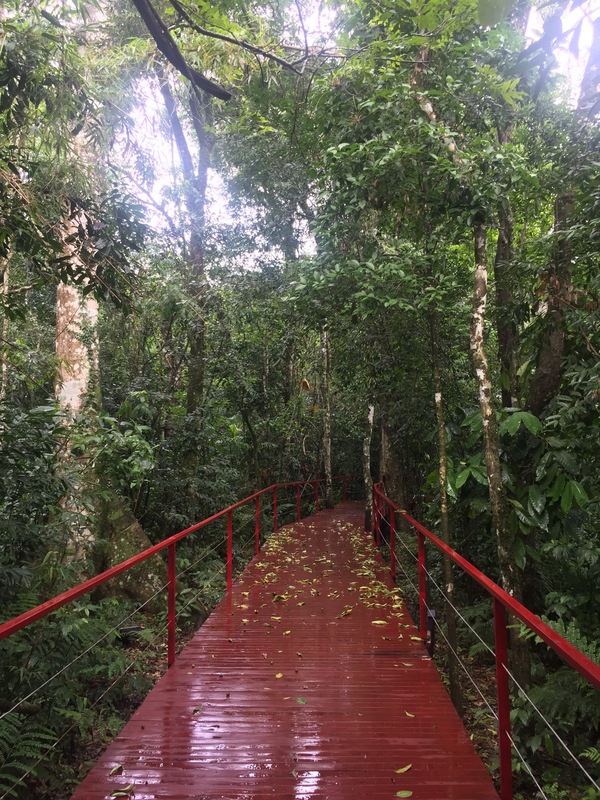 Lovely raised boardwalks through the jungle instead of hallways! And our room was worth the wait with our own private screened balconey with a hammock and cafe table and chairs! 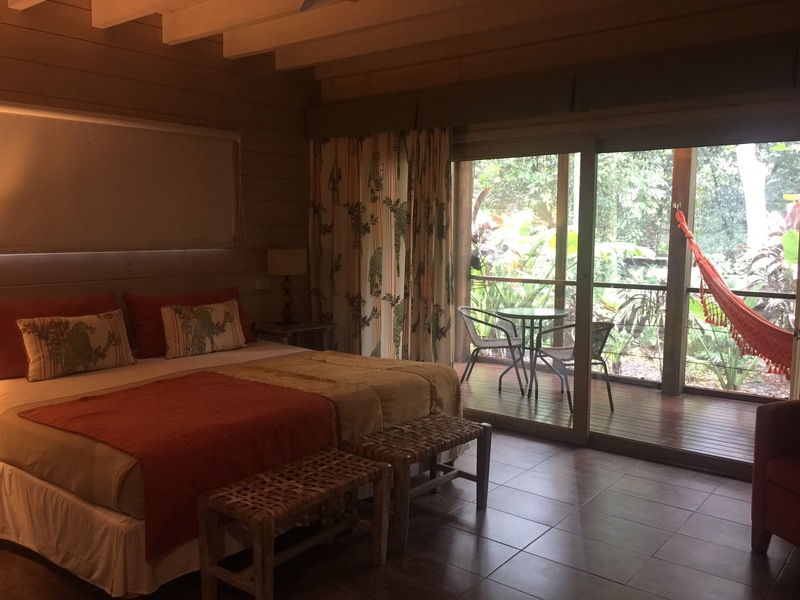 After last night’s fitful sleep, a nap was in order…it was drizzling outside…the perfect calming backdrop to a snooze! Once we were up we grabbed a taxi into town. Our first stop was to find a bank machine. Easier said that done! The first bank we tried seemed to only accept cards from their clients. FInally we stopped at the Information centre and they pointed out another bank. When we got there there was about 20 people in line… 2 bank machines were for any cards, and the third was for clients only! One of the “open” card machines stopped dispensing cash, but fortunately for us, we were able to get some $$ out of the last machine before it gave up the ghost. 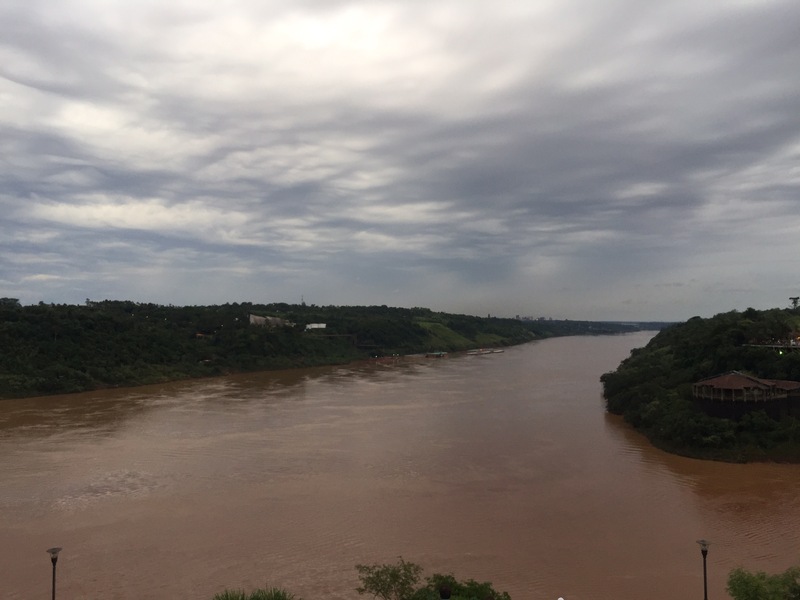 We then decided to walk to the confluence of the Paraguay and Iguazu rivers, where’re we could stand in Argentina and see Paraguay and Brazil just a few hundred metres across the water! Once we had our walk, we decided to find a cab and head to dinner. The humidity was at about 90%… far greater than it had been in Patagoinia! – we got lazy!! 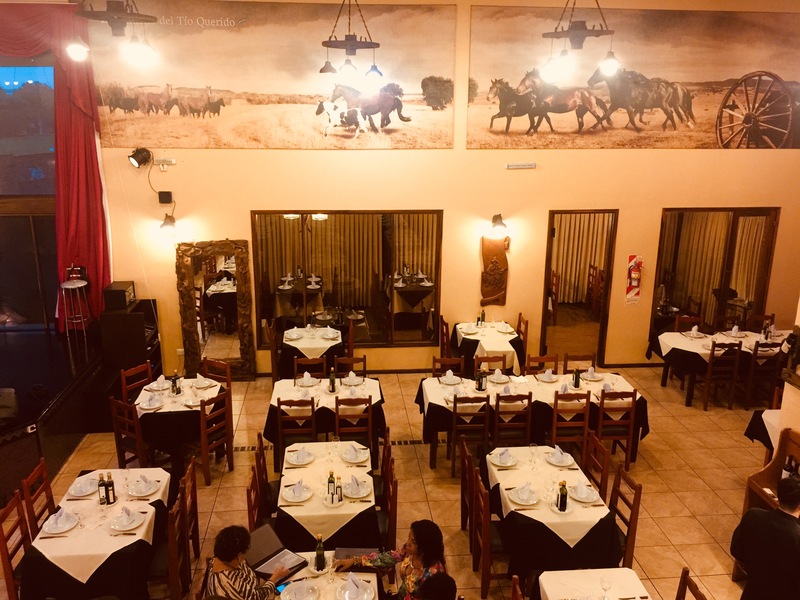 The restaurant was an authentic Argentinian BBQ, large and excellent. We had fun with our waiter as we wanted to try the Argentinian platter for two…he said “no” we wouldn’t like it… it has all the stomach organs included…he was right! We stuck with steak! But a lovely atmosphere complete with guitar entertainment as we were ready to leave. A quick cab ride home and we were ready for bed. Tomorrow will be an early start as Richardo is picking us up at 7:30 so we can get to the park at 8 for the opening! It promises to be a sunny day at about 28C. Lots of sunscreen and bug spray will be in order! See you then! As you said, nice hotel! And I think it was wise to skip the stomach organs for dinner! Looking forward to your pics and story from the falls! 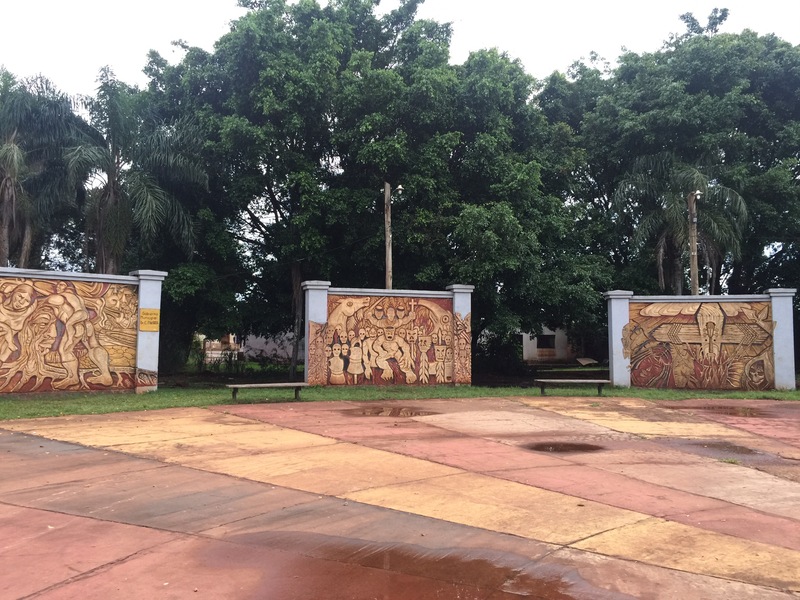 I just arrived in Iguazu tonight. How long are you guys here for?! We’re back in Buenos Aires! We head home on the 24th! Sorry to have missed you! Hope your trip has been wonderful!